It has long been a tradition for artists to learn by studying and copying the works of masters who came before them. In the middle of the 19th Century, it also became common practice to paint scenes from the lives of great artists, along with composers, poets, writers and other historical figures. 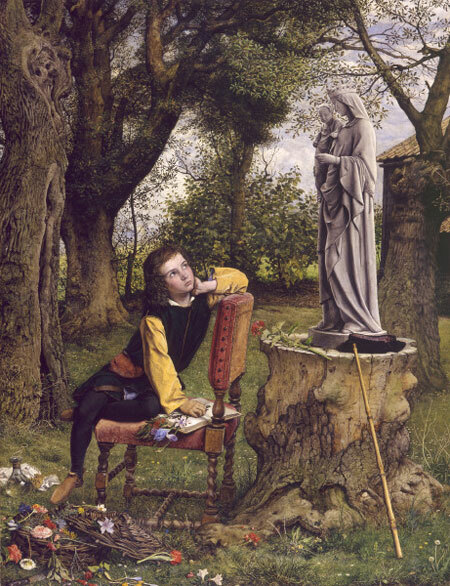 Here we have Scottish painter William Dyce giving us his fanciful interpretation of the great Venetian painter Titian as a child, inspired by a statue of the Virgin and Child, (and perhaps contemplating the pose as a painting), and experimenting with the colored juices of crushed flowers. Titian’s actual experimentation with color was likely in the studio of his master Giovanni Bellini, but in Titian Preparing to make his First Essay In Colouring (larger image here), Dyce has given us a wonderful vision of an artist he studied and admired deeply finding his inspiration in nature, as did Dyce himself. Perhaps because of those sentiments, Dyce was one of the few established artists to sympathize with and champion the young Pre-Raphaelite painters when the critics were savaging them (with the notable exception of John Ruskin, who supported the Pre-Raphaelites and also praised this painting by Dyce, as well as his strikingly detailed landscape Pegwell Bay, also here). Dyce took his influences from Renaissance masters, the Pre-Raphaelites and painters like Johann Overbeck and put them to work in religious and historically themed works; and a series of frescos, notably those in the Houses of Parliment that depicted scenes from the Authur legend. Dyce was also a musician, scholar and essayist, winning the Blackwell prize for an essay on the now quaint topic of animal megenitism and publishing a dissertation on Gregorian music. Dyce is sometimes listed as a Pre-Raphaelite painter, but that’s not correct. He influenced and was influenced by them, but was never an official member of their circle. When a student (almost 40 years ago) I have to do a copy of this same virgin statuette. It never went to the oven but I didn’t find the guts to destroy it and survived my apartment changes till today, collecting dust in a closet.